Keeping spirits bright during the dark days of January in New England can be challenging to say the least, trying to find a brief escape from the “winter hues” is a quest worth searching for. Many customers come into the tropical plant department at the West Roxbury, Ma. Home Depot seeking exactly that, an escape, to seek out and find the calming, tropical plants and the potted, flowering plants that bring some color into the grey winter days. 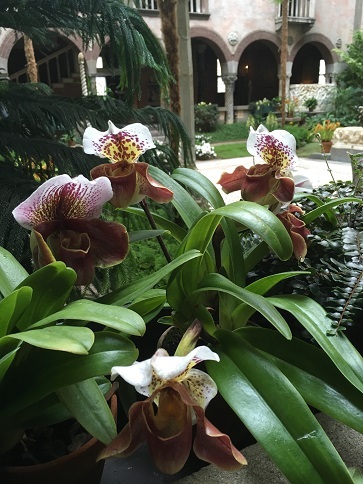 I feel blessed to work with plants, and to also help customers select the correct plants for their living and working spaces. I found an escape from the arctic temperatures that Boston was boasting this week. I spent some time at a wonderful museum that is home to collections of fine art masterpieces along with priceless antique furnishings, and sculptures carved in marble and wood, with breathtaking stain glass windows, and what seems like miles and miles of tapestries, but the most extraordinary space in the museum is the glass topped court yard. 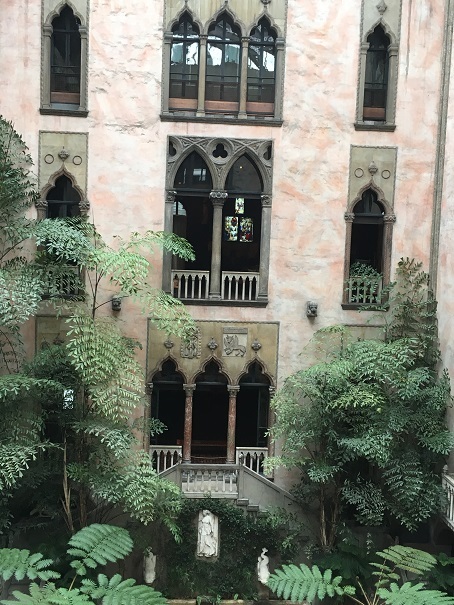 The Isabella Stewart Gardner Museum is a true palace in the, Fenway Neighborhood, of Boston. Although the glass roof of the glorious courtyard was covered with snow the daylight penetrated through the frozen crystals and made the space that much more magical…..a total escape. 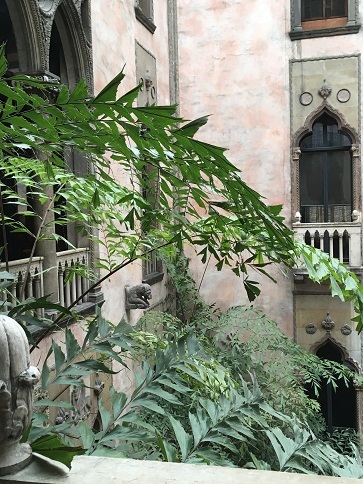 The tropical palms thrive within the confines of the palace courtyard; some seasonal changes, (that are orchestrated by the museums horticultural staff), take place throughout the year. Potted poinsettias are put in place during the Christmas holidays, nasturtiums drip from the window ledges during the spring and clusters of potted chrysanthemums for the autumn months and during the dark days of winter, exotic orchids and maidenhair ferns brighten the courtyards mosaic floor…..it is all just spectacular! 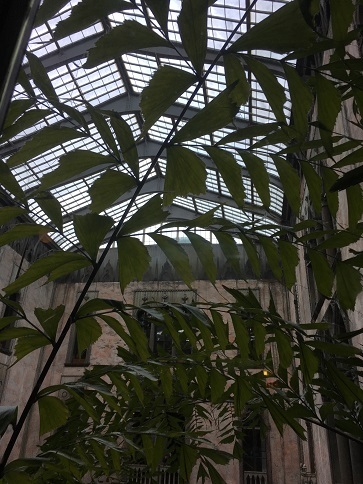 One of my favorite plants in the courtyard is the very mature Fish Tail Palm, I love all the plants, at every season, but the Fish Tail Palm is a constant, flanking the center staircase and gracefully reaching up to the light of glass roof, they must be at least 40 feet tall! The Fish Tail Palm is not a common houseplant here in the northeast but it can be available upon request at certain Home Depots throughout the country; all you have to do is ask about availability. The Fish Tale Palm takes a bit of care so most Home Depot stores do not stock them routinely, the Fish Tail Palms like a humid environment and loves to be misted to keep the humidity level high with evenly moist soil. High light, direct morning sun is okay or off to the side of a west facing window will suit the plants light requirements. Lots of room, a Fish Tail Palm will fill the space given and gracefully the “fin like leaf” branching fronds will reach for the light, it is just a beautiful palm. The ISG Museum is a sanctuary in the cold, busy city of Boston, it brings me joy! Find an escape at your local Home Depot, walk the aisle of the tropical plant tables, ask the live goods specialist about the Fish Tail Palm, check out the Majesty Palms, Sago Palms, Areca Palm, and all the other houseplants to purchase so that you can create your own sanctuary!